"Instead of targeting the biggest social networking site... [hackers] set their sights on smaller players like Pinterest," the report said. 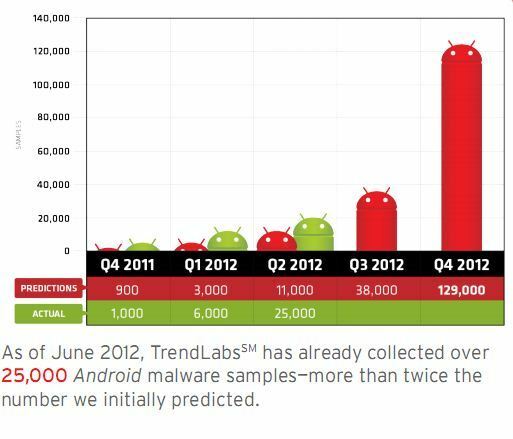 Trend Micro also reported that malware exploiting Google's mobile operating system, Android, continues to grow at an alarming rate. It said the number of malware programs aimed at Android devices reached 25,000 last quarter. By year's end, the company is predicting that number to balloon to 129,000. "The large Android user base translates to big business not only for Google but also for those who constantly target the OS," the report observed. “With more than 400 million active Android-based devices and more than 600,000 apps available on Google Play, the number of attacks has nowhere to go but up." "The fact that only 20 percent of Android-based devices have security apps installed does not help," it added. Malicious Android programs identified by Trend Mircro included Botpanda, which allows attackers to gain root privileges on a phone, and Spyera, with a repertoire that includes recording a target's phone calls.